What’s a dog to do? Sure, your dog enjoys a nice day at home—relaxing and doing nothing. It’s a dog’s life! There’s only one thing a dog enjoys more than snoozing all day— and it’s fun in the Southern California sun with a bunch of other dogs! This is why The Animal Keeper offers Doggie Day Camp — an exclusive program designed with your dog in mind. 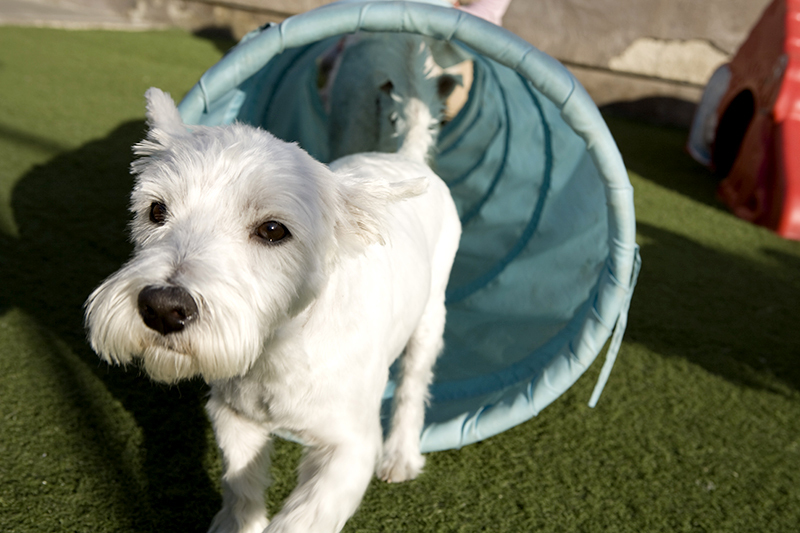 Doggie Day Camp will give your dog a balance of exercise, socialization, and fun along with our Day Camp staff. Your dog will love the fresh air and sunshine while being fully entertained with a variety of dog activities. Free play in the morning includes a game of tag, a little tug of war, playing with camp toys, tennis balls, and playground equipment; camp counselors use Chuckit! Tennis Ball Launchers to encourage fetch games. 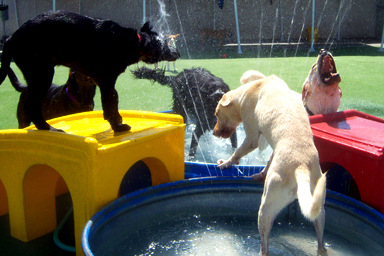 When the weather is warm and dogs want to cool off, campers can splash around in the refreshing doggie pools and misters. After a long day of play, pets get to nap, lounge in the sun, and play with their new camp friends. The Animal Keeper provides all that your doggie’s heart could desire. For busy pet owners who work long days, The Animal Keeper allows for your pooches to interact and play with friends for a half or full day of camp. Even for owners who just have errands to run or a busy day out of the house, a half or full day of Doggie Day Camp at The Animal Keeper offers your pets’ entertainment and company. For dogs that get lonely, bored, or destructive when left home alone, Doggie Day Camp offers the attention and activity they require to keep your house running smoothly. Instead of returning home to a pup that is full of pent up energy, anxiety, and a mouthful of couch or shoe, let The Animal Keeper help you bring home a tired and well-exercised pup. Most of all, Doggie Day Camp gives your dog a chance to socialize and hang with the pack! Your pups will benefit greatly from engaging in some much needed socialization and fun with their doggie camp mates. The Animal Keeper offers two options for Doggie Day Camp: Big Dog Camp and Tiny Tot Camp. We know that little ones are a bit intimidated by big dogs and we want all our guests to have fun! Tiny Tots Camp is an exclusive service for small dogs and is a whole group of pals just the right size! All dogs, big and small, must pass our complimentary socialization test to be qualified for our Doggie Day Camp. By passing this socialization test, your pets prove that they may be a welcome addition to our playgroups that promote good manners towards fellow camp mates and plenty of fun. This behavioral test is done to ensure the safety of both your beloved pets and the staff, and allows for a drama free day at The Animal Keeper! Through consultation with our on staff Certified Professional Dog Trainer, Penny Milne, we have developed playgroup guidelines and staff training programs that ensure our employees entertain your pups while keeping them safe! Our company does not believe in banning certain breeds; instead we prefer to evaluate dogs on their individual qualities to evaluate how well they might do when introduced to Doggie Day Camp. Dogs are closely supervised by our highly trained staff, and have access to clean drinking water at all times. Yards are cleaned and sanitized daily to ensure the health of your pups. After a fun and busy day at camp, your pups will return home tired and relaxed. As the saying goes, “A tired dog is a good dog!” Drop by the nearest Animal Keeper and see for yourself how much fun these dogs are having with the help of our knowledgeable personnel. We welcome you to come and take a tour of our entire facility and to observe our playgroups before signing up your pup. Give your “best friend” a day or two (or seven) of Day Camp. They’ll thank you for it! At The Animal Keeper, we like to keep your pets entertained and busy. Your pet can choose from the following, additional pet activities when they stay with us. Learn more about all pet activities to find the right one for your pet. We are glad to be able to accommodate pets that need medications. The fee varies with the type of medications needed—please inquire. Pets own food—We are glad to be able to accommodate pets that have special feeding needs.